Rebel Wilson claimed that she's the "first-ever plus-size girl" to star in a rom-com, which caused a huge backlash on social media. Wilson appeared on The Ellen DeGeneres Show and talked about her upcoming movie, Isn't It Romantic. The actress made the bold claim on the show, and social media was quick to point out that Queen Latifah and Mo'Nique have starred in rom-coms well before Wilson's next project hits theaters. However, Wilson started to get into the social media war, which only seems to have made matters worse. Queen Latifah and Mo'Nique aren't the only plus-size girls to have starred in a rom-com. Rikki Lake starred in the 1989 romantic comedy Babycakes as a makeup artist trying to get the romantic attention of the man of her dreams. Additionally, Nikki Blonsky starred in the 2007 Hairspray remake. The point being, Rebel Wilson is certainly not the first plus-size woman to take on that role, which was pointed out by a lot of people on social media. One woman, who claimed to be a Rebel Wilson fan brought up Queen Latifah and Mo'Nique, specifically. The woman then said, "she isn't the first plus size woman to play the lead in a romantic comedy." The tweet was not mean-spirited, but Wilson felt the need to respond to the post. She had this to say. "Hey girl! Yeah I of course know of these movies but it was questionable as to whether: 1. Technically those actresses were plus size when filming those movies or 2. Technically those films are categorized/billed as a studio rom-com with a sole lead. So there's a slight grey area." 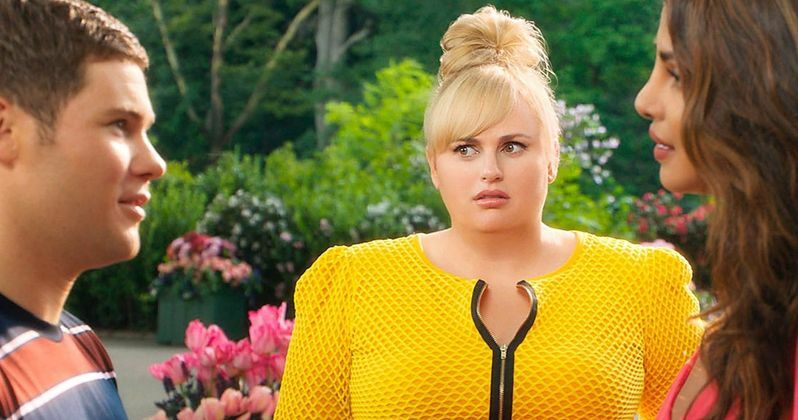 Rebel Wilson's response isn't exactly what the Twitter community wanted to hear. More messages defending Queen Latifah and Mo'Nique started to pop up. Additionally, more than one fan was disappointed that the 38-year old actress just didn't admit to being wrong. "You really could have just said you were wrong and apologized instead of doubling down," said one responder. For the most part, a lot of the messages towards Wilson have been respectful, which is pretty rare, but there are some pretty vicious responses as well. The plus-size comments weren't the only aspect of Isn't It Romantic that was attacked. One Twitter user claims that the story was ripped off from one of her own short films, entitled Love Handles. There are some similarities between the two films, but Rebel Wilson responded to settle the score. She explains. "Hey guys just saw this. As a writer it may be frustrating to see something that's similar to an idea you've had but our movie was written 6 years ago by Erin, then developed for years at New Line with Dana & Katie and filmed almost two years ago x." Rebel Wilson's response to the plagiarism claims were a lot more well-received than her plus-sized rom-com claims. The plus-sized debates are still raging on social media, which doesn't bode well for the February 14th release date of Isn't It Romantic. Wilson has yet to respond to anymore of the online hatred being thrown her way. You can check out some of the posts below as well as the video that started the controversy in the first place, thanks to The Ellen Show YouTube channel. “Just Wright” is rom-com Queen Latifah starred in. And yes by Hollywood AND White standards, she is viewed as plus-sized. It’s okay to admit you misspoke. Rebel isn’t even the first white plus size woman to be the lead in a rom com or is Hairspray neither romantic or a comedy?